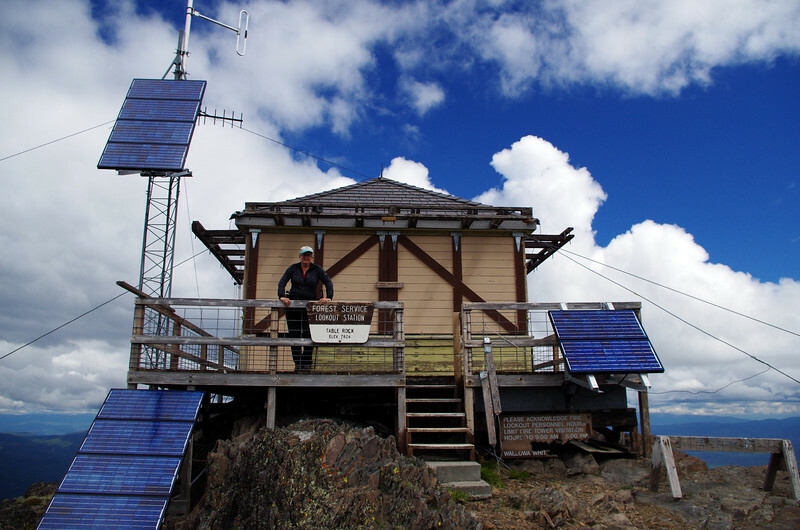 In late 2015, as we were assembling our hiking to do list for 2016, it occurred to us that we had yet to at least visit all of Oregon’s 47 established federal wilderness areas (there are three proposed ones but, with Congress now at peak efficiency, who knows when or if these will ever be established?) 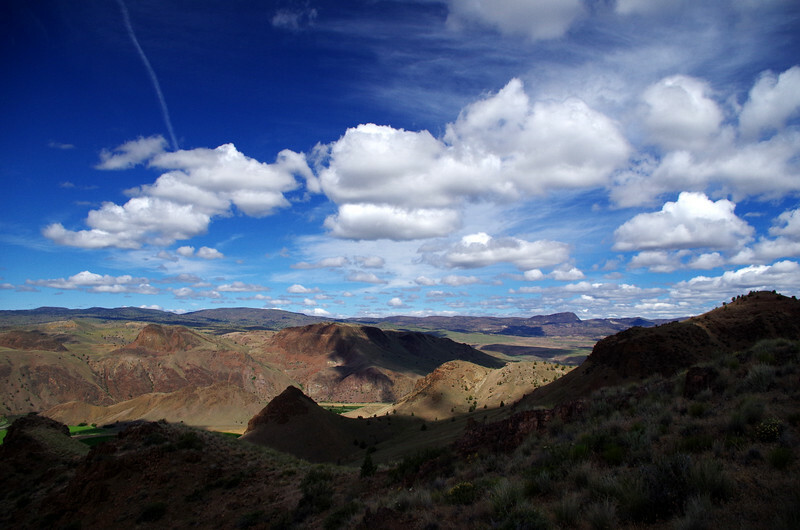 (Oregon’s Wilderness Areas). Two of the 47 (Oregon Islands and Three Arch Rocks) are closed to public entry (and would require amphibious operations even if they were open). Of the remaining 45, we had hiked, as of 2015, all but 18. So we planned some trips to visit these. 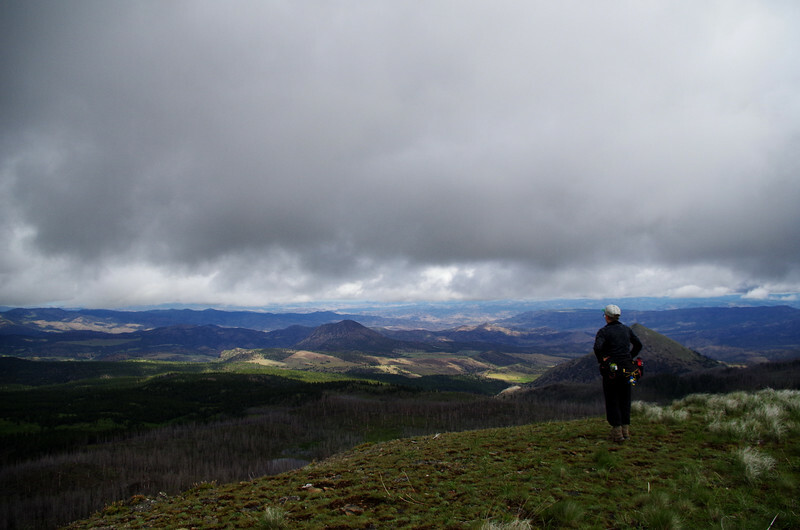 We got this project underway in January 2016 with visits to the five wilderness areas along Oregon’s coast: Drift Creek, Cummins Creek, Rock Creek, Copper-Salmon, and Grassy Knob. 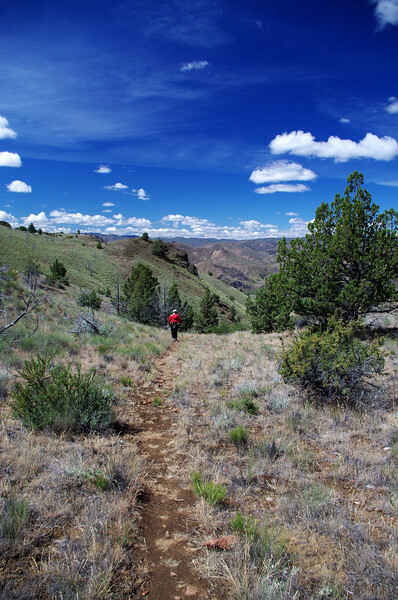 We then identified five more in Eastern Oregon (Spring Basin, Bridge Creek, Black Canyon, Monument Rock, Oregon Badlands) that we thought might become accessible early in the season. In retrospect, we were mostly right about this, in that snow was not a factor, but also a little wrong in that we forgot to account for downed trees and the lingering effects of wildfires on road and trail access. We drove (through a hail storm) up to Prineville the night before and then set out early for the 1.5 hour drive to the trailhead. 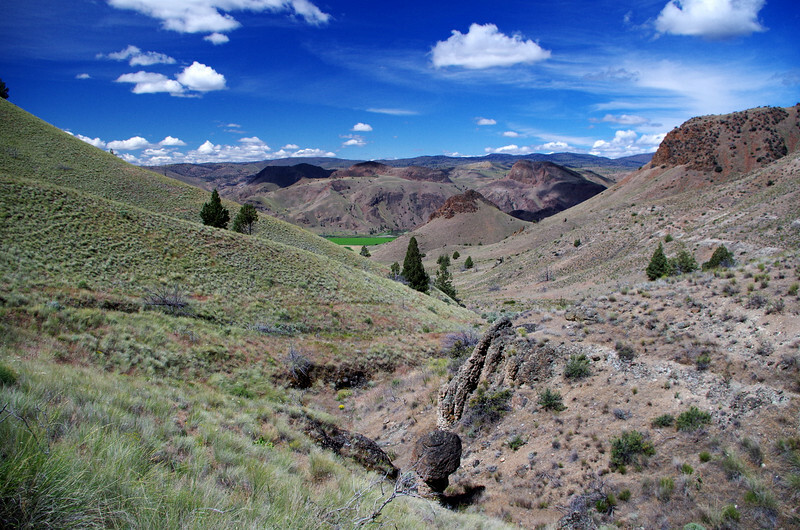 This 6,404 acre wilderness, designated in 2009, overlooks the John Day River south of State Highway 218 near Clarno, Oregon (brochure). 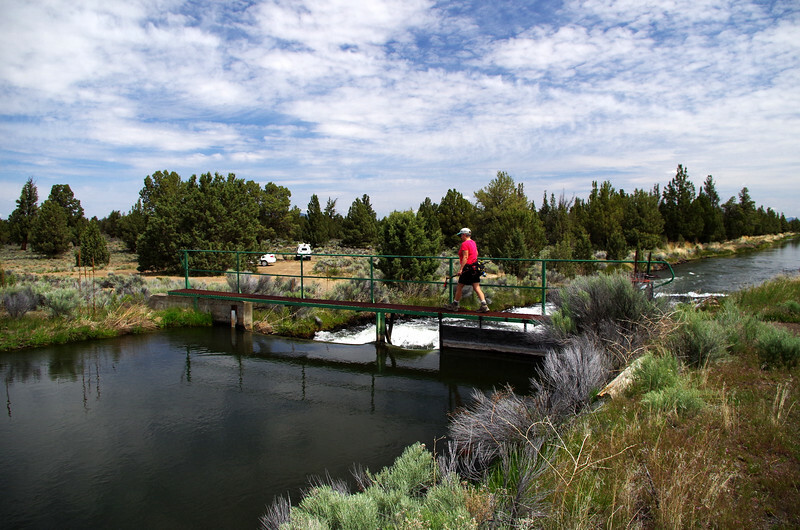 It’s managed by the Bureau of Land Management (BLM) and is named for a spring in its center, which produces water year-round, a much needed oasis in these dry uplands. 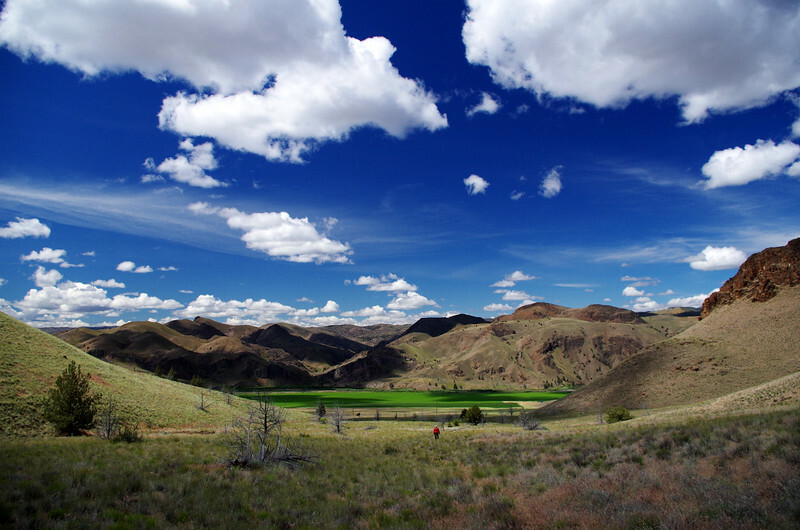 The BLM brochure promised a tapestry of rolling hills, with spectacular vistas of the river and surrounding landscape, with a profusion of desert wildflowers in the Spring. While we might have missed the wildflower maximum, there were still quite a few and the views were truly expansive. 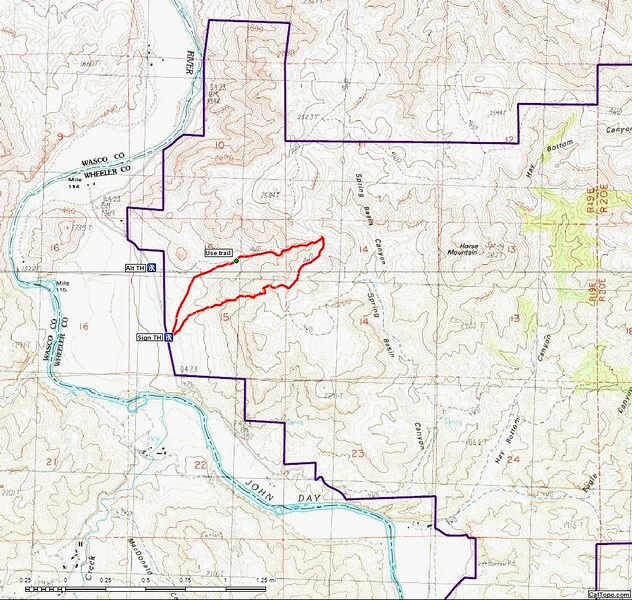 The BLM map shows one trailhead on the west side of the wilderness, about 3.5 miles south along the Clarno Road (44.86904, -120.44006), where the wilderness boundary intersects the road. There’s a large sign here and parking off the road for several vehicles – but no other facilities. Here we found only a very faint (i.e., trampled grass) use trail leading east into the wilderness. So we assumed the role of hiking lemmings and followed that trail east up into a canyon. and Point 2854 to the north, an area thus far untouched by fire. 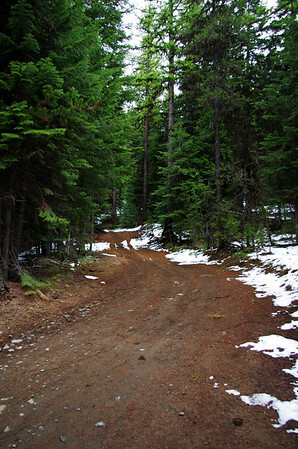 And, like many recently established wilderness areas, the “trails” here consist of old, weathered 4×4 jeep roads – some still evident, some mostly gone. As promised, the views were astounding and we got to enjoy them under almost perfect bluebird weather condition (which, sadly, wouldn’t last for our whole trip). We followed the jeep trail north to a saddle just below Point 2584 where we expected to find yet another old jeep trail heading downward to the west. 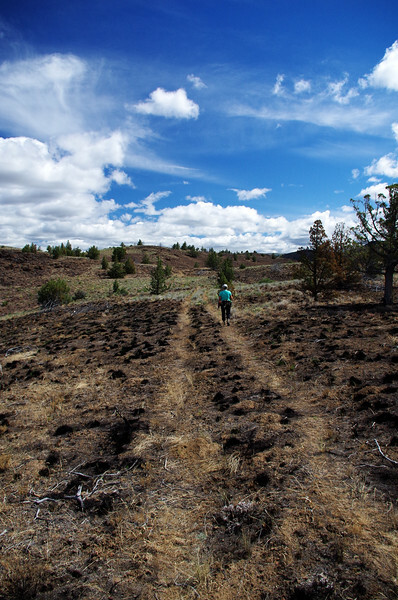 What we found instead was a well defined use trail – which would occasionally resurrect itself as a two-track. So off we went, following the trail or two-track down a canyon that was a little less steep and easier to hike in than the one we’d come up. 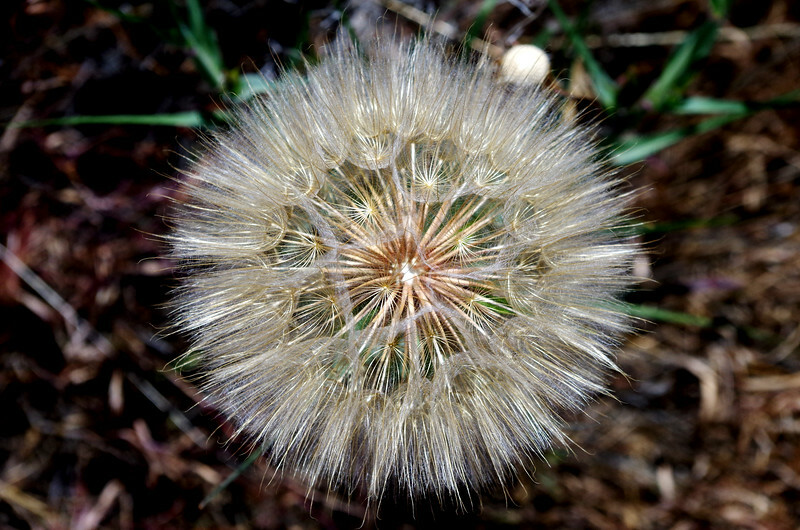 and a Western yellow salsify (or Western Goat’s Beard) seed head. As we got lower, the use trail continued due west, so we had to contour south toward where we’d parked. Only 2.8 miles roundtrip, with 900 feet of gain but a great introduction to a wilderness worthy of further exploration. 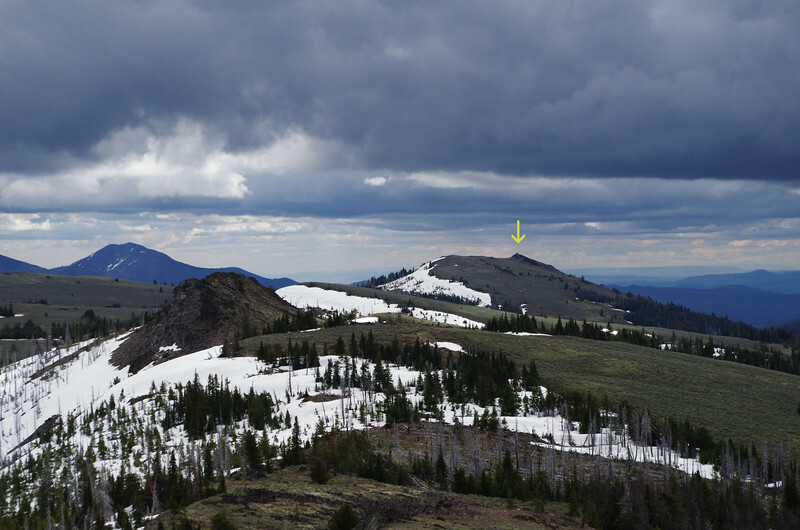 Because it’s mostly all below 3,000 feet, this would be a great place for an early season backpack, keeping in mind that water sources are very limited. On our way out, we stopped to check-out where the old jeep trail we’d followed down reached the road. We found a small parking area and a BLM trail marker post but no other signage – if you didn’t know it was here it would be easy to just drive on by (as we did). This “alternative” trailhead is the obvious place to park if you want to follow the well-used use trail (old jeep road) up the canyon, rather than wander up through the brush. 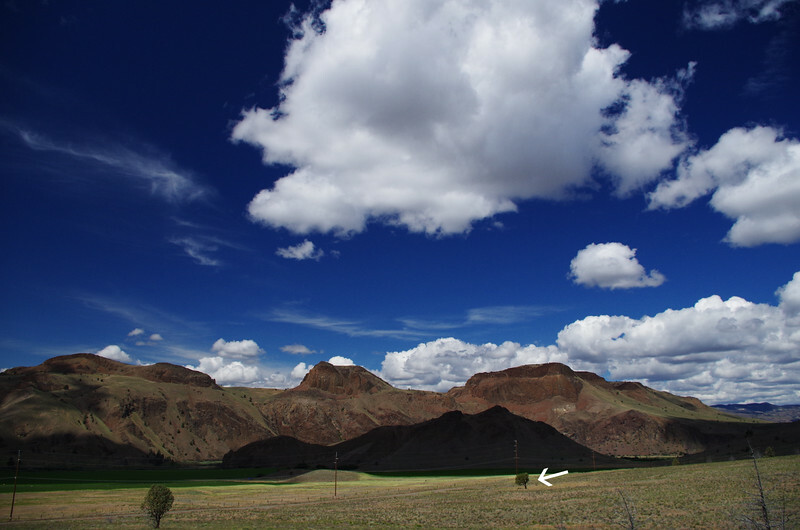 But our map shows this location as being on private land, so it’s not clear whether the BLM has worked out some deal with the landowner (or not). Seems safer to park at the big sign and contour back to this better use trail. 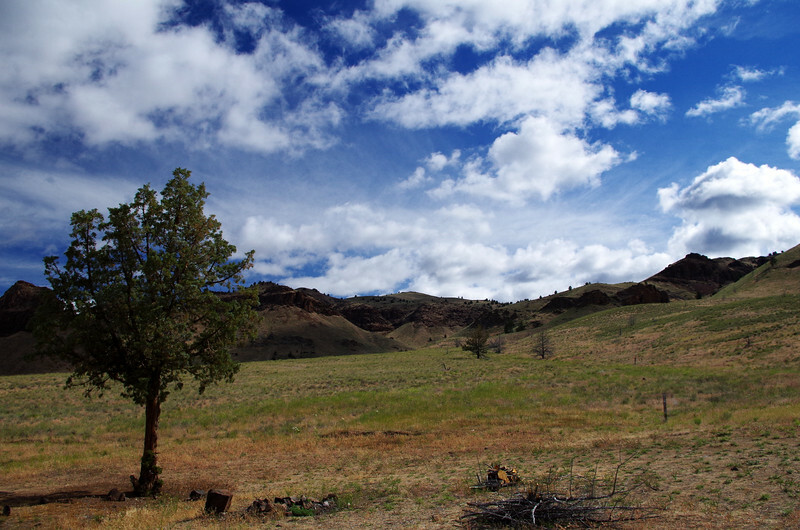 We spent another night in Prineville and headed-out early the next morning for the Bridge Creek Wilderness. 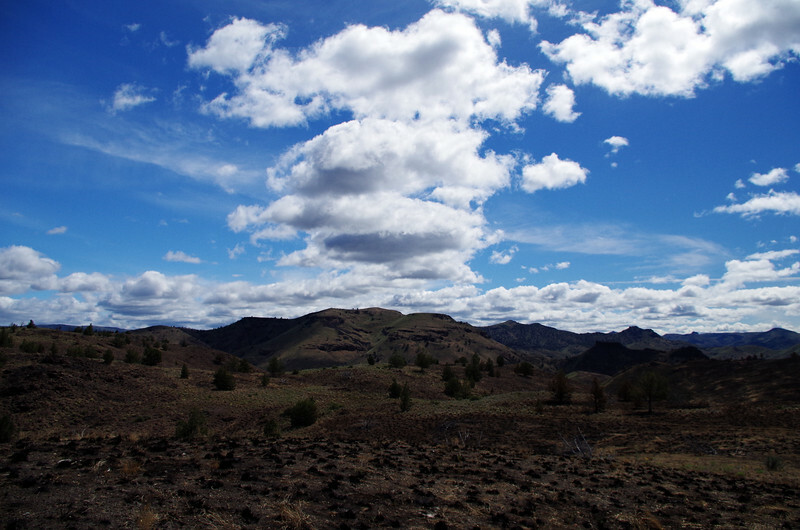 It was sunny in Prineville but the bluebird of weather happiness had deserted us and gloomy, foreboding clouds had gathered to the east over our destination. Sadly, we had forgotten the old saw about summer not reaching Oregon until July 4th and would face “Mayuary” weather instead. Sigh. 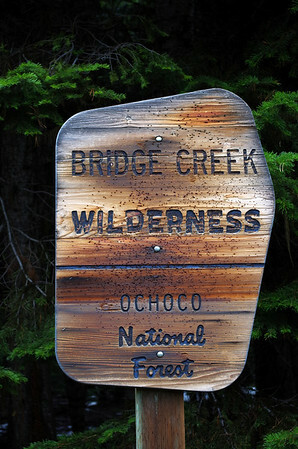 Bridge Creek is a 5,400-acre wilderness running west to east along the summit of the Ochoco Mountains (details). 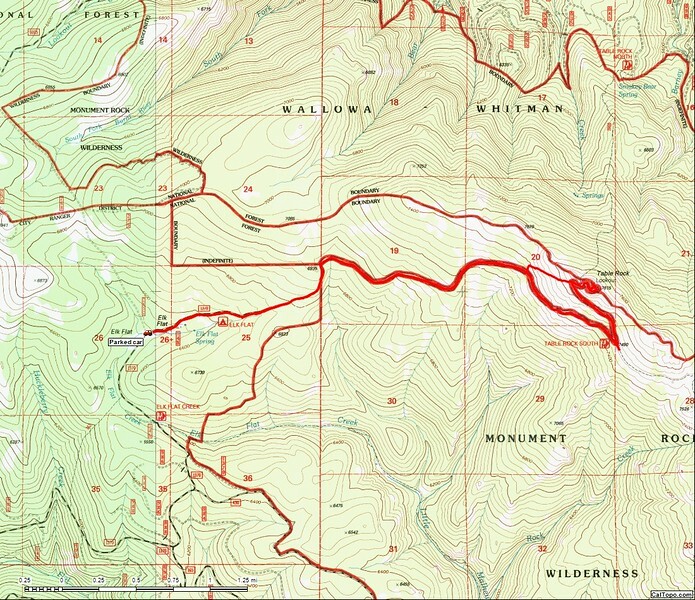 While there are no maintained trails in this wilderness, there is (or was) an abandoned jeep track (no longer shown on many maps) that runs about 1.2 miles from near Pisgah Springs (on Forest Road (FR) 2630) to North Point (this is Hike #118 in Sullivan’s Eastern Oregon guide (3rd Edition)). 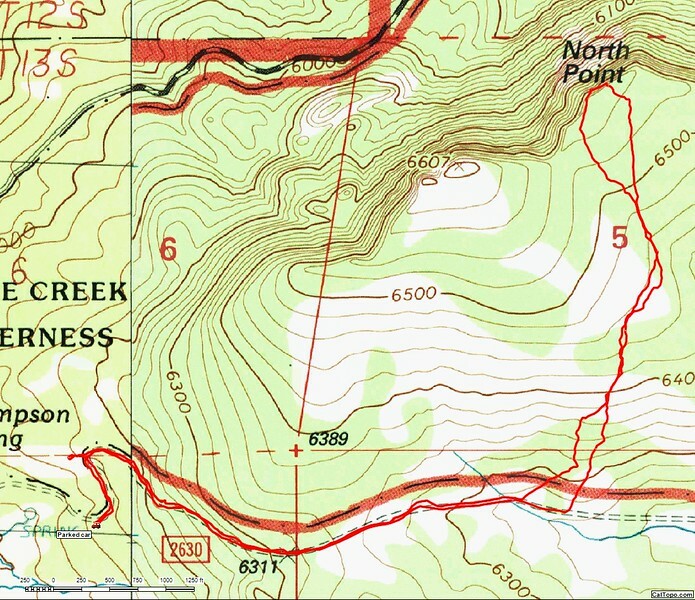 East Point (at 6,625 feet) is the high point in this wilderness, while the highest point on the rim is Point 6607 rather than the “North Point” shown on many topo maps. 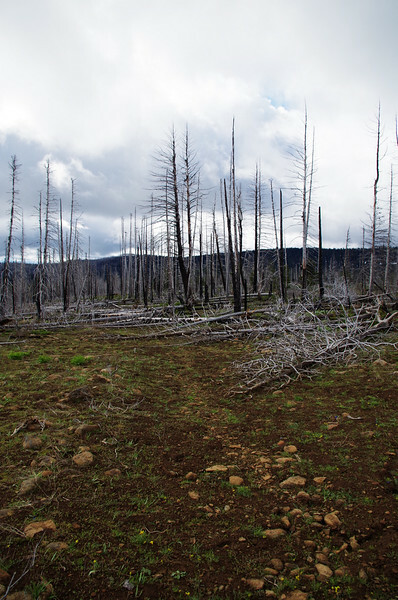 However – as we would find out – the 2008 Bridge Creek Fire burned most of the wilderness to stand replacement conditions and many fired-killed trees have now fallen across this old jeep track, making a faithful following of it a frustrating task at best. We followed Sullivan’s directions [note that FR 150 simply becomes FR 2360] to reach the junction of FR 2630 and FR 450 near Thompson Spring – all the roads were clear and free of obstructions. FR 2630 eastward of that point was supposedly rough, so we did not (uncharacteristically) attempt to force a passage with our rental Ford Fiesta. Instead, we parked at the S-bend in FR 2630 and walked from there. Of course, with 250 yards or so, the road conditions improved markedly and, if we’d been just a little more daring, could have easily driven it. 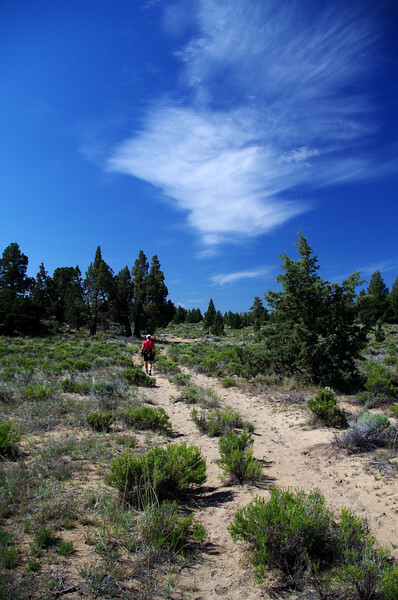 After actually seeing the terrain, it seemed easier just to head toward North Point across some open sagebrush rather than go out to the old jeep road and then have to backtrack a bit. 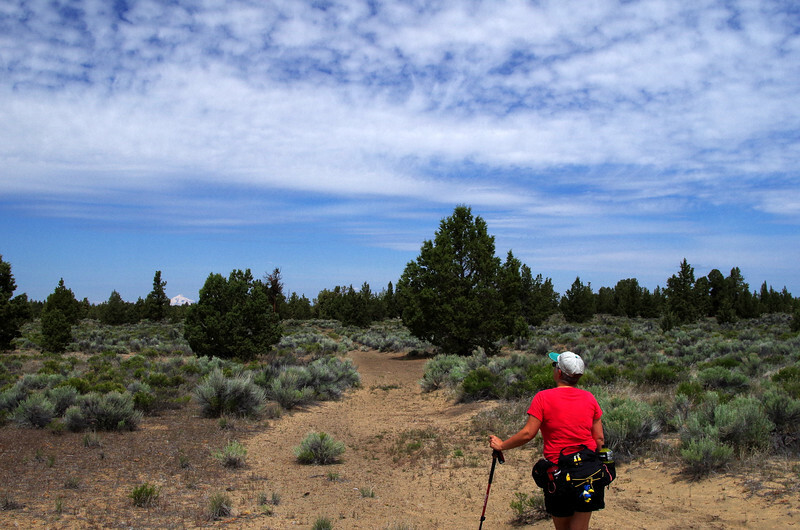 So when we came into alignment with Pisgah Lookout, we turned north up through the sagebrush. 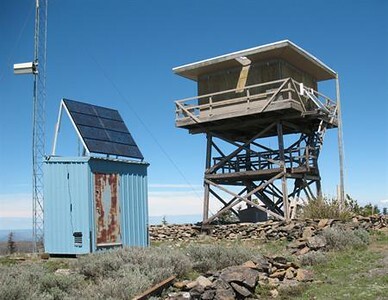 The current lookout (still in active service) is a 20-foot wooden tower with a R-6 14 foot by 14 foot flattop live-in cab with catwalk constructed in 1964. 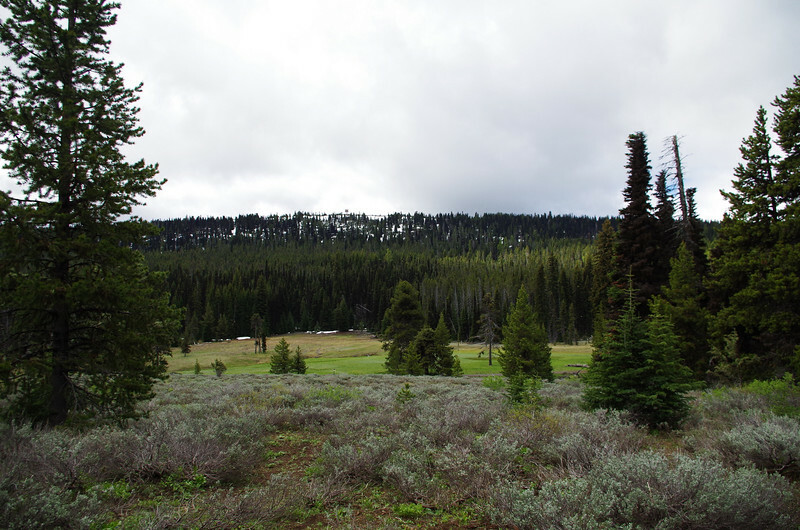 It is the fifth tower the Ochoco National Forest has built on this site. The first was a 10-foot platform in 1919, followed by a 35-foot open platform tower with a ground cabin in 1923. In 1929 a cab was built on the platform. In 1933 a 20-foot L-4 cab was constructed on a 20-foot tower and this served for 31 years until the present lookout was built. 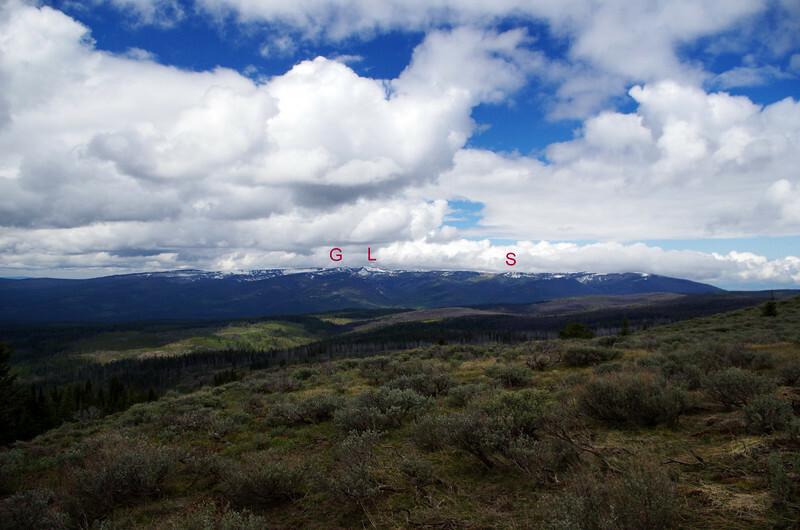 We briefly lost sight of the lookout as we passed through a small stand of trees and then out into an even larger expanse of sagebrush. This was easy travel and we soon intersected the old jeep road to find that it was very faint and heavily obstructed by fallen burned trees. Going cross-country was definitely the way to go here. and of the burned areas around North Pisgah Spring to the north. 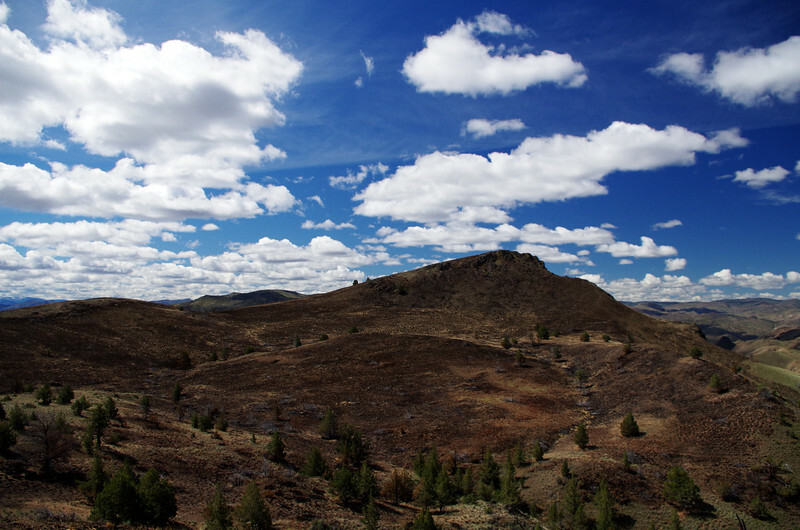 We had been under threat of rain from the start of this hike, so after a short stay at North Point, we retraced our steps down across the sagebrush and then west along FR 2630 to our car. Rain showers started pelting us as we drove past Walton Lake on the way out. A short hike (4.1 miles; 500 feet of elevation gain) which could be made shorter if you push past the rough section on FR 2630. On a clear, sunny day it would be well worth it to hike out and take in the view from North Point or Point 6607! 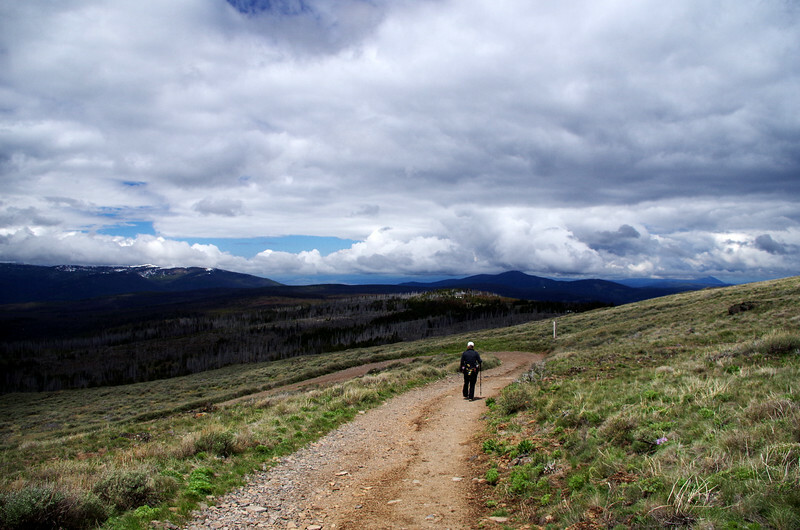 Black Canyon is a 13,400 acre wilderness which hosts 18 miles of maintained trails (USFS). 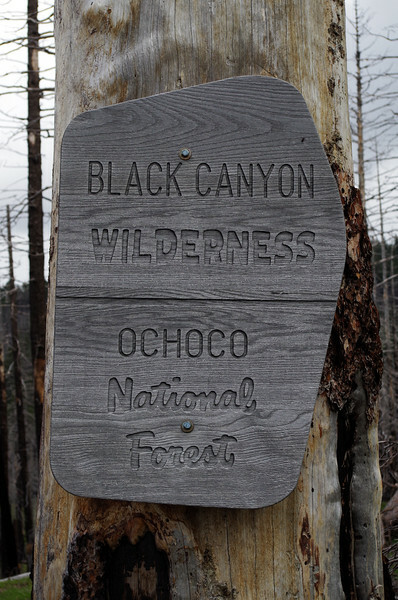 However, in 2008, the lightning-started Black Canyon and Wolf Fires merged and became the Black Canyon Fire, which expanded beyond the wilderness boundary. 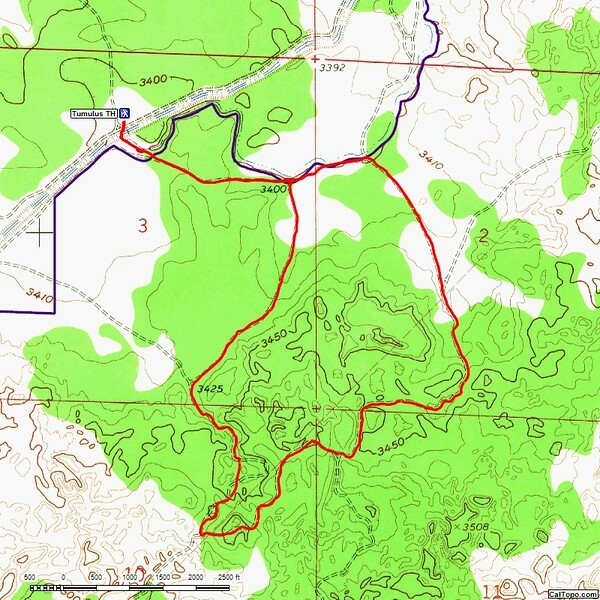 Ultimately, the total size was 1,551 acres, with 849 acres in the wilderness. 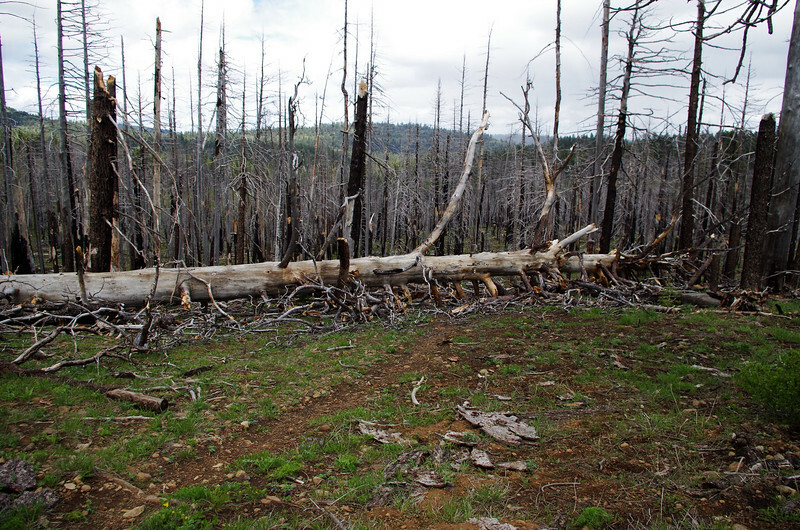 Both fires were of high intensity and primarily stand replacement in character, which contributed to many downed trees. Per the USFS, trails are intermittently maintained and downed trees, brush covered segments of trail, and route finding challenges may be expected (details). What this would mean for us didn’t become apparent until we finally reached Boeing Field and the Owl Creek (Trail #820A) trailhead. From Bridge Creek, we drove east on State Hwy 26 through Mitchell and then 13 miles further to FR 12. From there, we followed Sullivan’s directions (this is Hike #17 in his Eastern Oregon guide (3rd edition)) to Boeing Field. 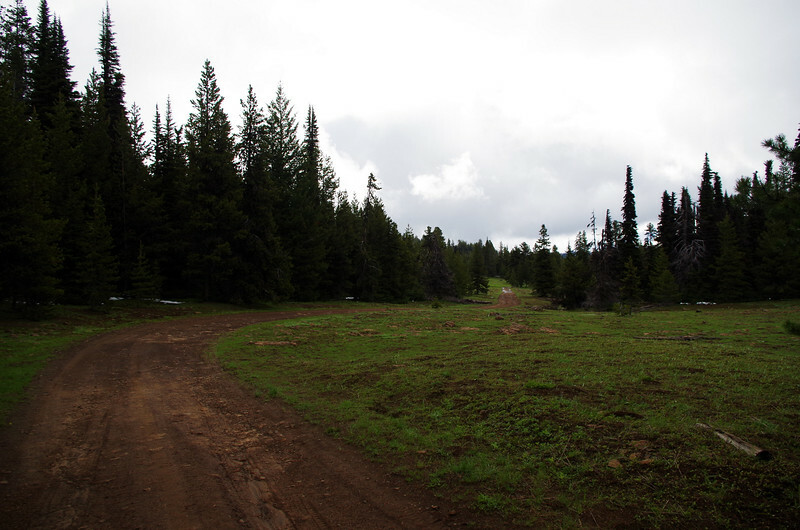 This was mostly on decent gravel roads but there were a lot of trees down – many cleared, some not. We managed to make an off-road crux move around a 24-inch monster that had completely closed the road by (finally) treating the rental Fiesta as the 4×4 in wanted to be. Worried that we wouldn’t be able to repeat this performance on the way out, we took a chance on what proved to be a much easier and more direct way out (and in) through Paulina. We backtracked on FR 38 and then took FR 3810 all the way down to County HIghway 63 just east of Paulina. Per the Forest Service, you can also reach Boeing Field by traveling 13 miles northeast of Paulina and turning onto FR 58 toward Sugar Creek Campground. Continue on FR 58, then turn north (left) at Sugar Creek Day Use Area onto FR 5810 and follow it 9.5 miles to Boeing Field. BUT – there are a maze of roads in this forest, so please don’t try either of these routes without a current forest service road map! 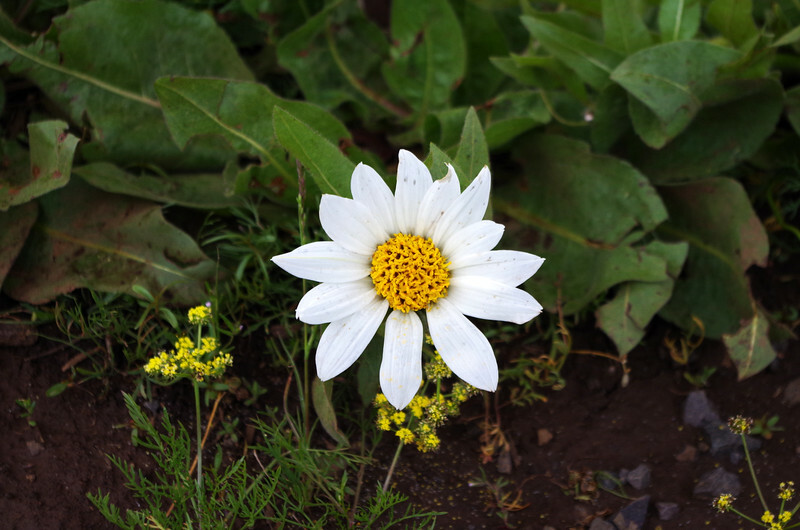 including White mules-ears – which look a lot like balsamroot but aren’t. 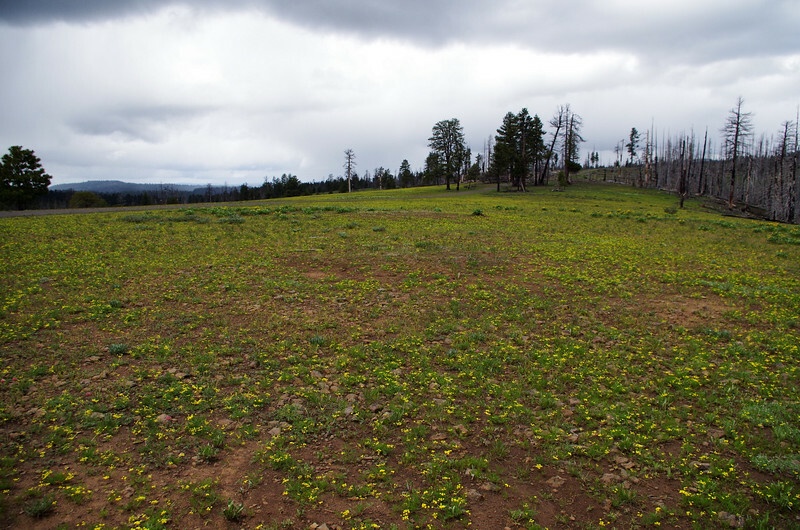 This broad open meadow takes its name from the crash of a two-engine B-18 bomber during World War II, in which four servicemen perished. 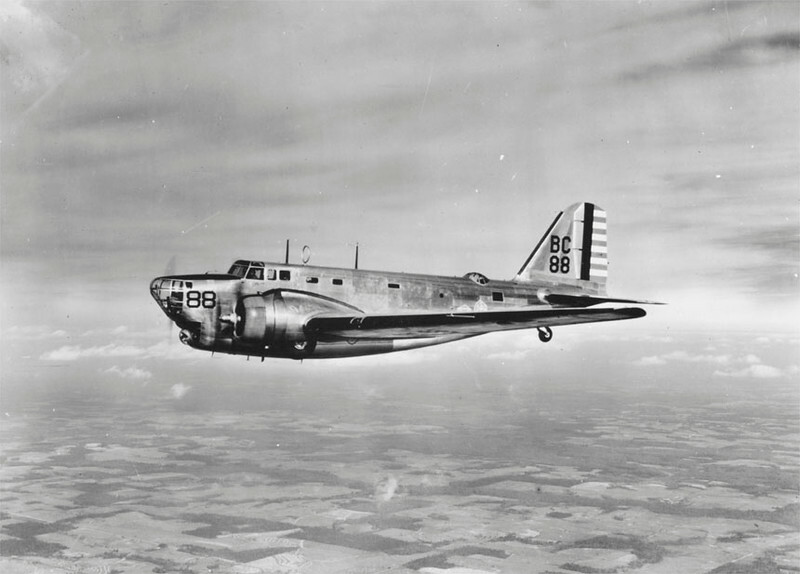 The B-18 (actually built by Douglas Aircraft, not Boeing) didn’t prove suitable as a heavy bomber and was supplanted by the deservedly more famous B-17 Flying Fortress in 1942. A B-18 did, however, manage to sink a German U-boat. 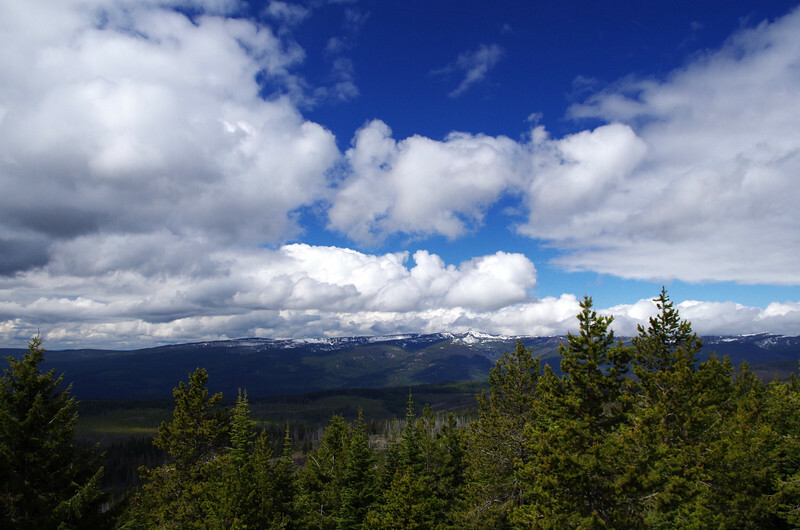 Rain was still threatening (as was the possibility of an exciting drive out of here) but we thought there might be time for the short hike down to Owl Creek. 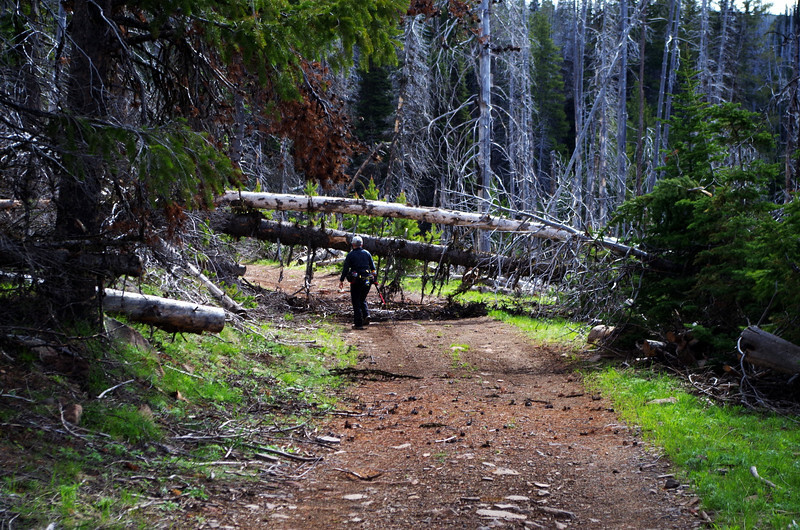 But a few yards down the #820A trail – which was pretty faint to start with – we encountered a major downed tree challenge. Beyond this, all we could see was a faint trail covered with lots of fallen limbs and more downed trees, it having been a hard winter in these parts. As we were pondering these challenges, it started raining. Clearly a straw + camel’s back situation. So, after a few seconds of deep thought, it became clear that our preferred option was a hot burger and cold microbrew in John Day. 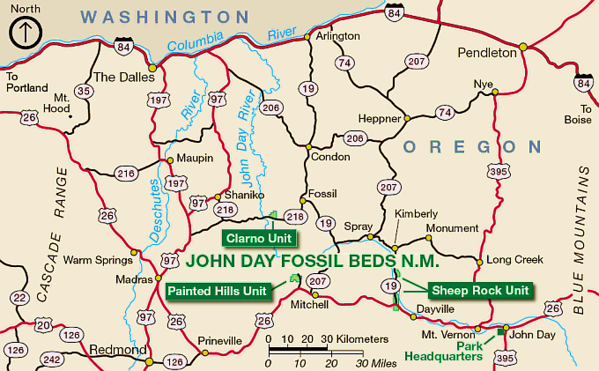 Thus we retreated, lucked-out on finding the easy drive out, and were in John Day in a couple of hours. 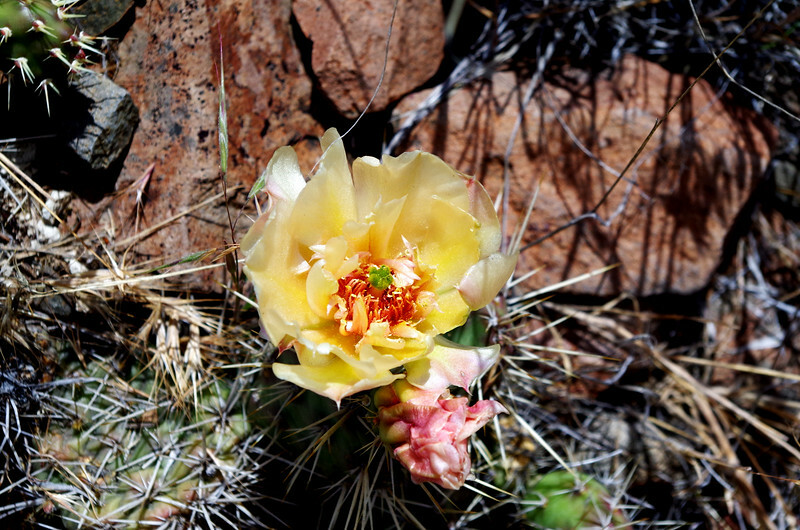 The Black Canyon Wilderness certainly deserves a more in-depth look, but the long drive and possible lack of trail maintence makes that a tricky proposition. 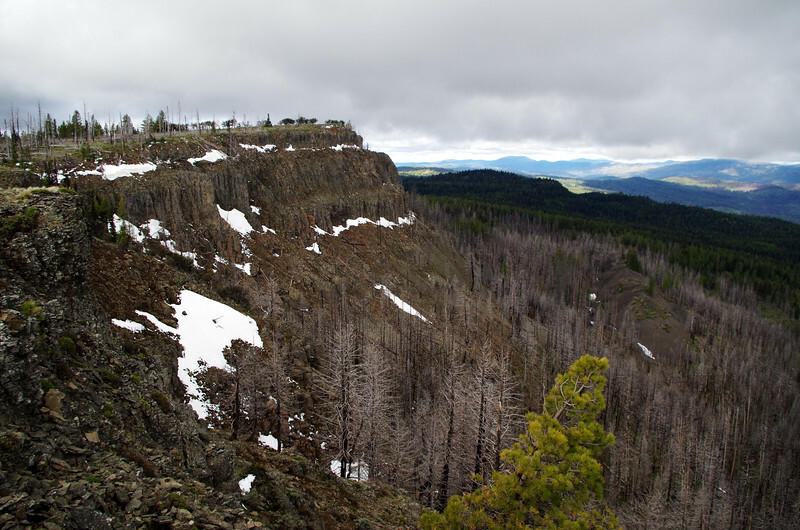 The Monument Rock Wilderness is located at the southernmost edge of the Blue Mountains and along the eastern edge of the Strawberry Mountain range (details). 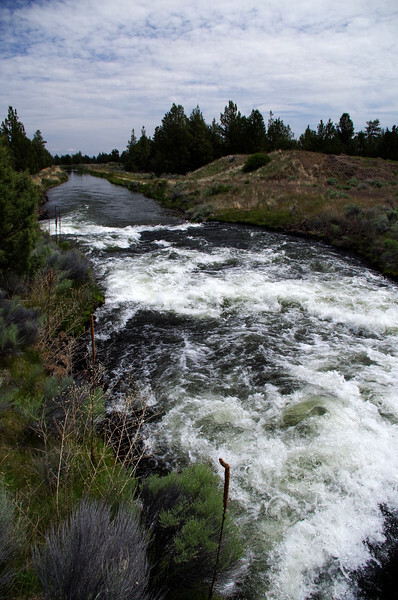 It was designated in 1984 and now encompasses a total of 20,210 acres. 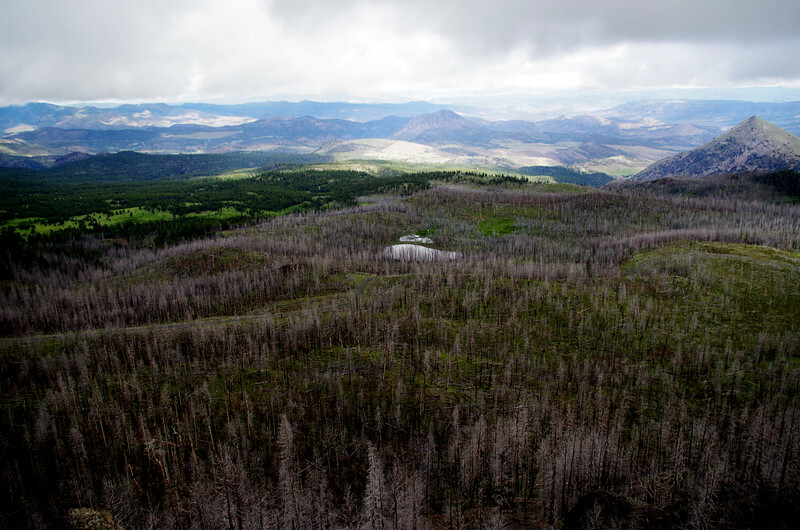 It’s managed by both the Malheur and Wallowa-Whitman National Forests (USFS). After a night in John Day (with quality time spent at the 1188 Brewing Company), we drove to Prairie City and then, following Sullivan’s directions (this is Hike #26 in his Eastern Oregon guide (3rd Edition)), continued on toward the Table Rock trailhead (Trail #365) for the Monument Rock Wilderness (USFS Trail #320). The roads were open and passable by a sedan (no 4×4-style heroics required here!) 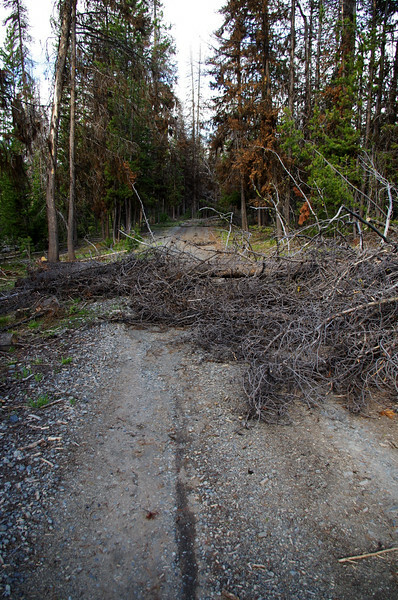 until just short of the Elk Flat Spring Campground, where we found FR 1370 completely blocked by fallen trees. Only a chainsaw would have helped us here. With the weather still making threatening gestures, it didn’t look as though we’d be able to hike the now 15 miles out-and-back to Monument and Bullrun Rocks without getting wet. 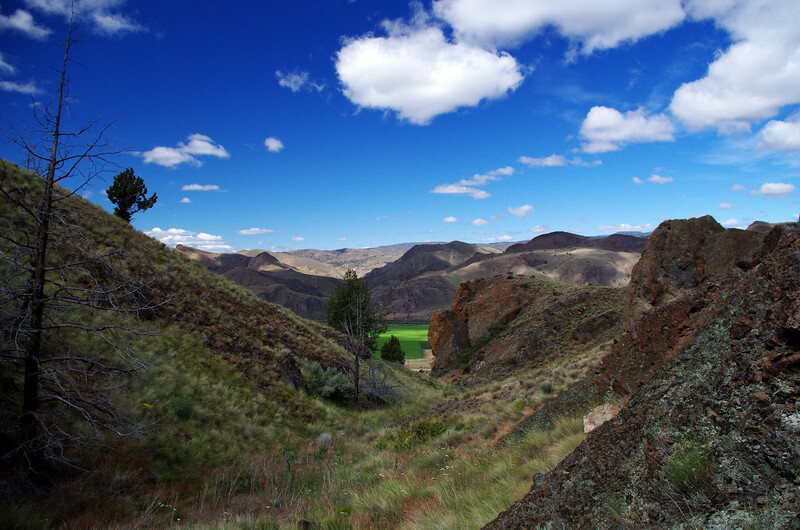 After pondering our options, we decided to park at Elk Flat – which looks like a delightful place to camp – and walk the 9 miles round-trip on FR 1370 to the lookout atop Table Rock. We’d get to visit a corner of the wilderness and a cool lookout, so this seemed like a win-win compromise. and Castle Rock to the south. Because irony seems like a constant theme with us, we half expected to find the road completely open after that first show-stopper blowdown. Instead, we had to step over, under, or around at least two dozen other blowdowns, some quite large. 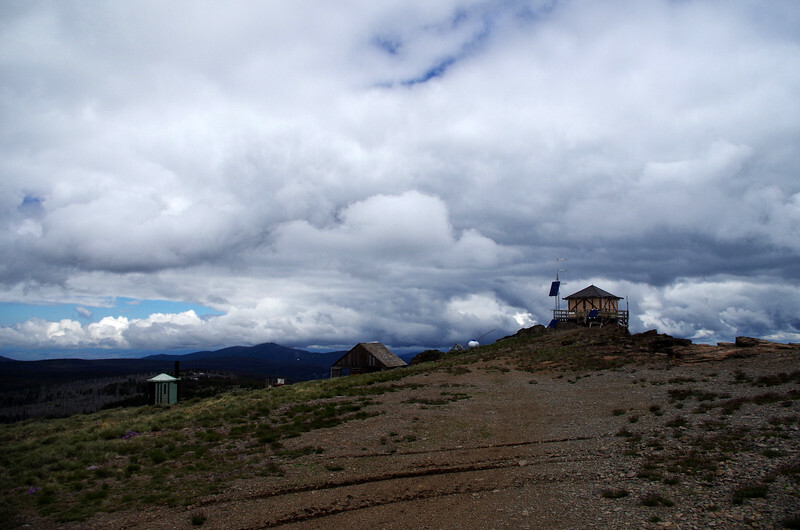 The Forest Service will have some work to do to open the road so the lookout can be opened and staffed for the season. 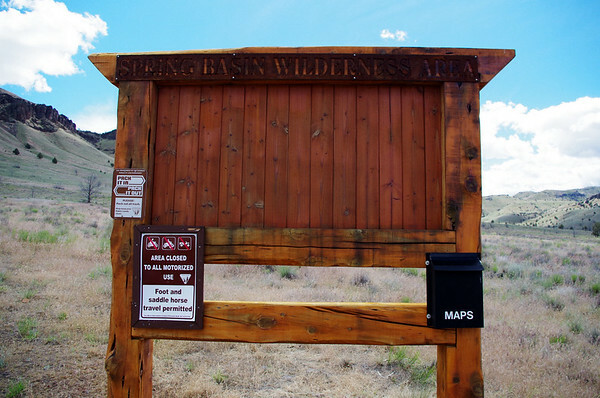 After 3.8 miles, we reached the #320 trailhead, to find a notice that the “…trail has not been maintained…” (not too big an issue since much of it is through sagebrush) and that someone had stolen the wilderness sign. Sigh. So we turned and started the short climb up to the lookout. 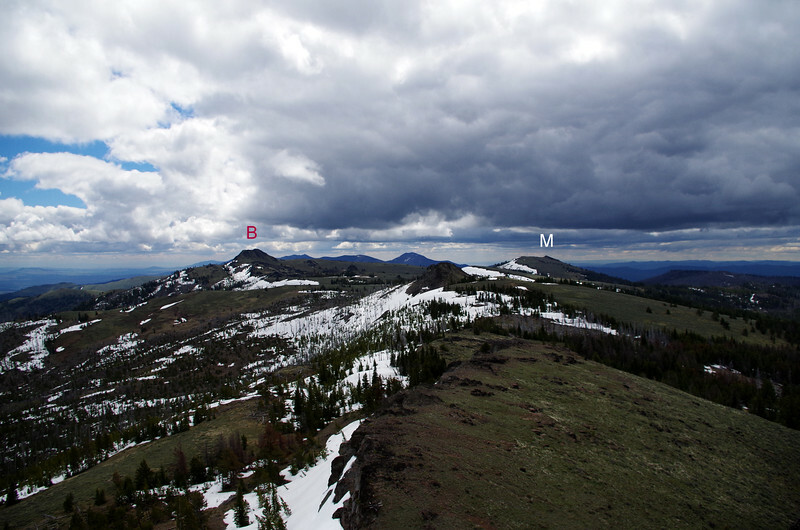 Table Rock Lookout is a classic early lookout site in the southern tip of the Wallowa-Whitman National Forest in eastern Oregon. It began as a cupola built in the early 1920s, which was replaced in 1937 with a 14-foot by 14-foot L-4 cab with catwalk, and then with a new L-4 in 1949. 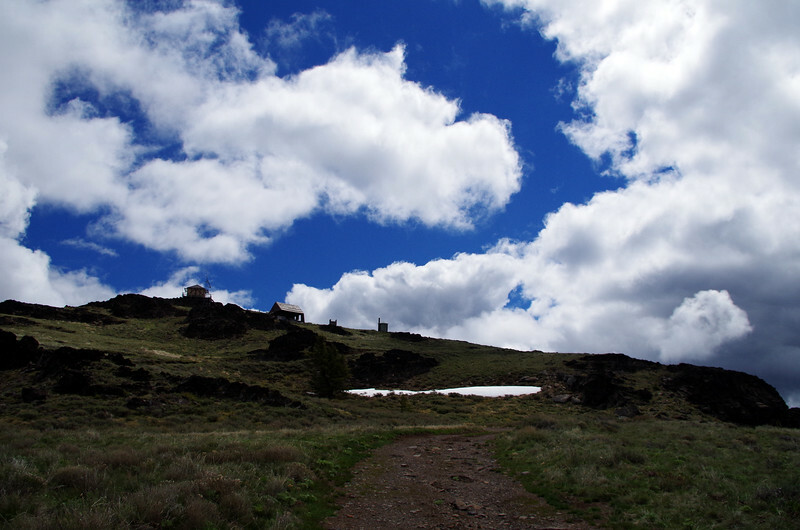 It is still staffed every summer and is listed on the National Historic Lookout Register (but the hideous green outhouse is hopefully not). and also across into the central Strawberry Range. 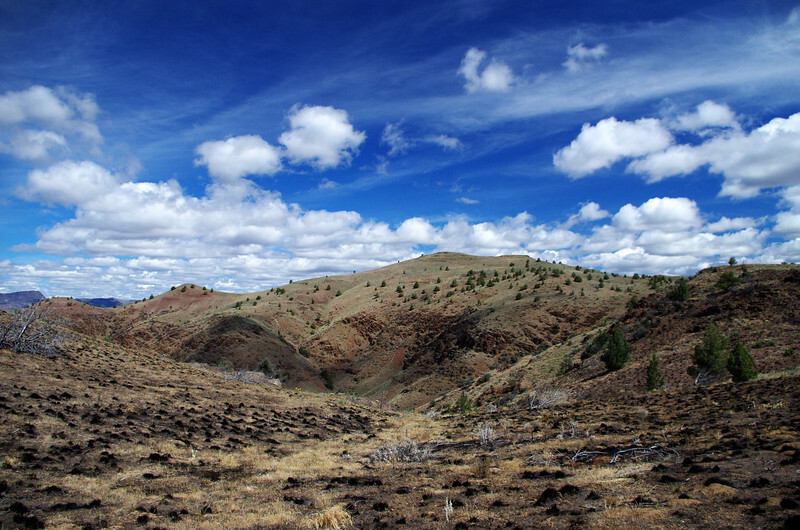 We had hiked this Lookout Mountain (there are several in Oregon) in 2012 and Strawberry Mountain in 2010. 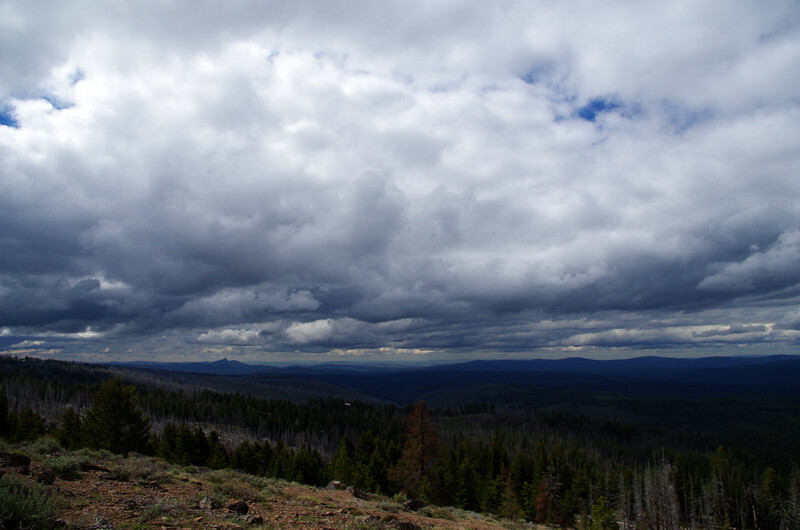 All the scary clouds never did anything and there was even a token sunbreak as we headed back, going cross-country through the sagebrush below the lookout so we could say we hiked (a little) in the wilderness. An easy road hike (8.5 miles round-trip; 1,300 feet of elevation gain) to a wilderness that we’d like to come back and visit again (when the road’s open!!). 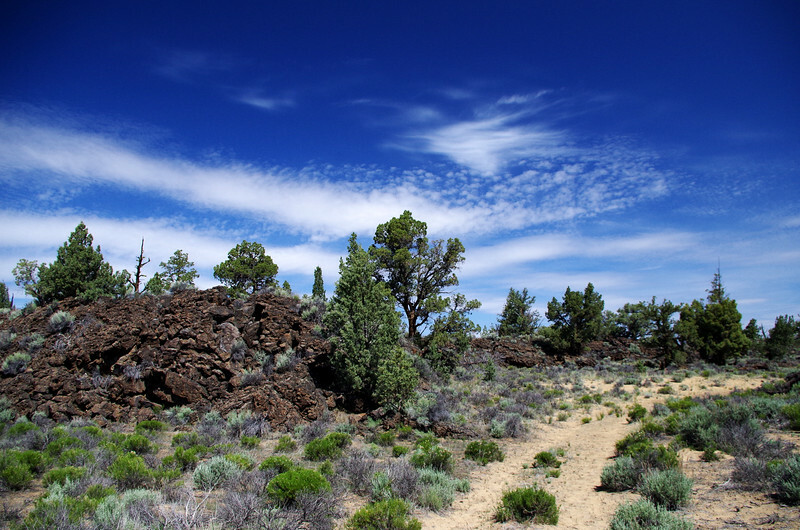 The Oregon Badlands Wilderness is located just southeast of Bend, Oregon (details). 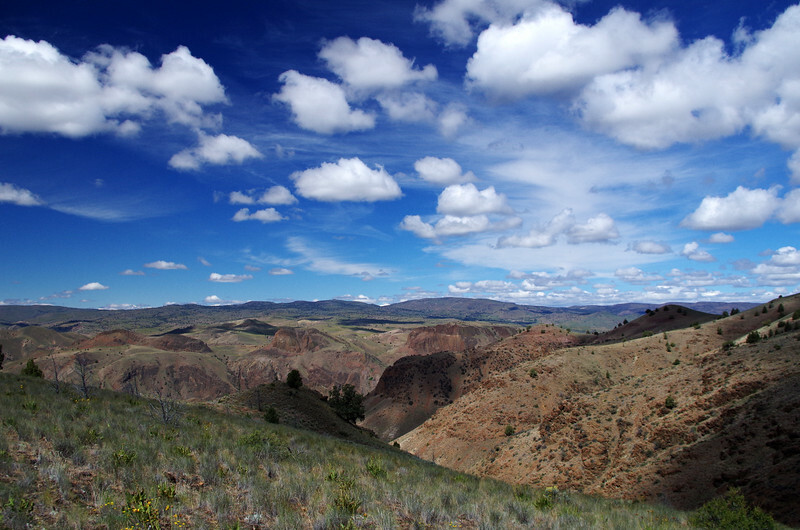 It was designated in 2009, now encompasses a total of 29,180 acres, and is managed by the BLM (BLM). 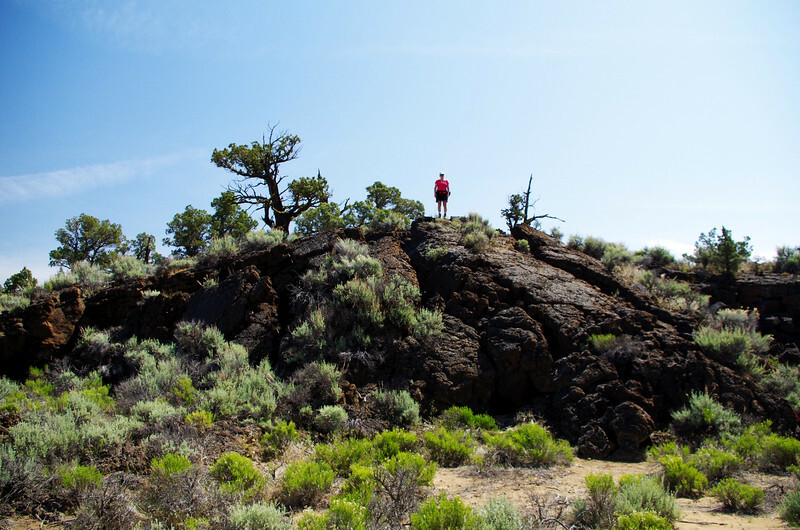 It’s southern trailheads (e.g., Flatiron, Badlands Rock) seem to see the most action since they lead to intriguing lava formations in the heart of the wilderness. So we decided to explore from the Tumulus trailhead on the north side of the wilderness (trailhead map). 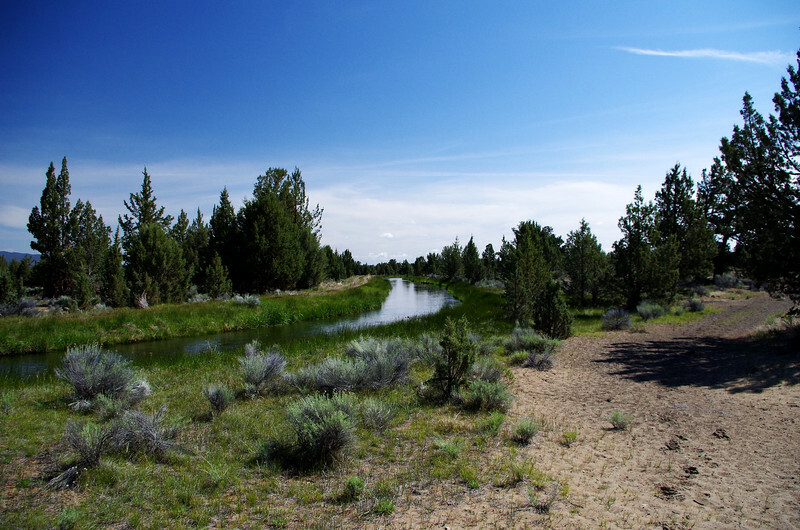 After spending the night in Burns, we made the 2 hour drive to Dodds Road off State Highway 20 and, at milepost 6 on Dodds Road, turned right on a poorly signed dirt road for the 0.9 mile drive to the unsigned Tumulus Trailhead (no facilities) next to a roaring canal. 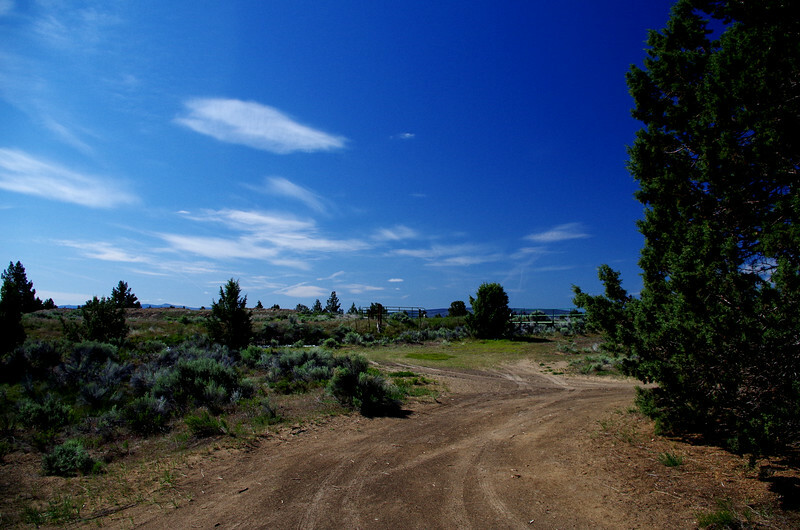 and then out into the desert to a junction with the Black Lava Trail, which we took south. flows that proved irresistible to The LovedOne’s instinct to seek higher ground. A little further along, we turned east on the Basalt Trail and, shortly after that, north on the Tumulus Trail. Views were hard to come by, but we did catch glimpses of the Three Sisters and of Mount Jefferson. After 4.5 “grueling” miles (and 100 feet of elevation gain! ), we were again crossing the canal to the trailhead. Given that it was a weekday at a less popular trailhead, we didn’t see anyone else. 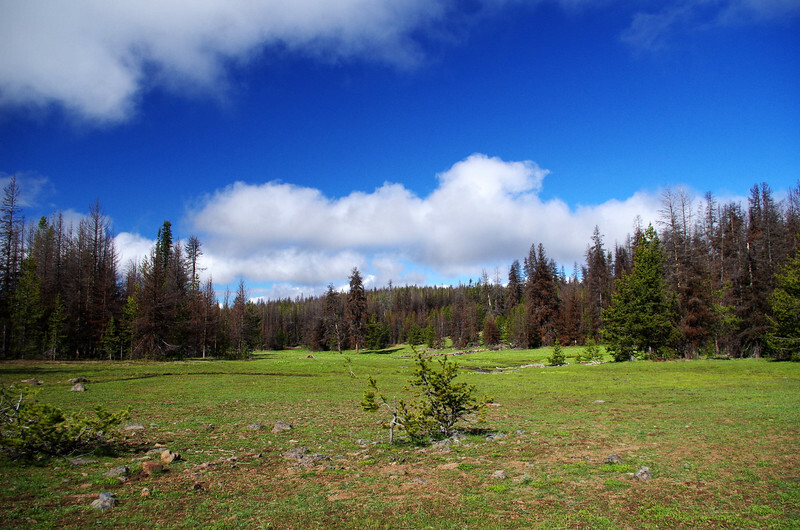 But one can imagine that, with it’s proximity to Bend and Portland, that this wilderness probably sees the most hiker action of all the ones we visited on this trip. And then we were done (for the moment). After a night in Bend – which seems to be bouncing back enthusiastically (and then some) from the 2008 recession – we sped home to the State of Jefferson. All told, we drove about 1,100 miles and hiked for a total of 19 miles to visit five wilderness areas in four days. To us, it was well worth it to get out and actually experience (even a little) these preciously rare areas. Do you have other pictures of Trillium, other than the one of ovatum with insects? Trillium (in season) is pretty common in Oregon, so I probably have some photos of it from previous hikes, particularly in the Columbia Gorge. But we didn’t see any on this hike (or we did and I just didn’t photograph them).